Windows 7 Theme Uniko is created by kiko11. Sorry for the unintentionally wrong mention of the artist and developer that stayed here before. This Visual Style is for Windows 7. It is works on both 32 and 64-bit. Included system files are for Service Pack 1. Supports top, bottom, left and taskbar. The pack contains the theme itself, Orb for top and bottom, Explorerframe, for x64 & x86 users, Tools like “Add Take Owenership Option”, “Uxtheme Patch”, “Windows 7 Start Orb Changer” etc. It is a RAR download, the file is very light, only 3.9 MB in size. This Article Has Been Shared 1900 Times! I think window 7 is best for every one because it has highly resistance and great stuff and reliable for us.. So please read its more feature..
What made you to think spamming in this way will work, huh? Don’t you mean “Windows 7 Theme Uniko is created by kiko11” and not Solmiler . Definitely Windows 7 Theme Uniko is created by kiko11 ! I am talking with the great creator who has created it, right ? Thank you very much for correcting it and pardon me for the wrongly mentioned other nice artist’s name and url. 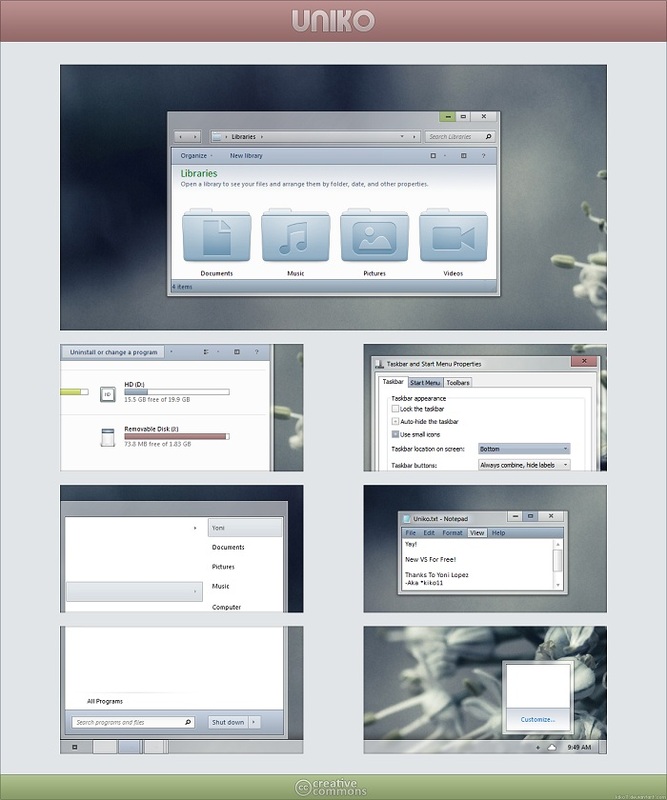 Cite this article as: Abhishek Ghosh, "Windows 7 Theme Uniko : Another Refreshing Visual Style," in The Customize Windows, December 16, 2011, April 18, 2019, https://thecustomizewindows.com/2011/12/windows-7-theme-uniko-another-refreshing-visual-style/.